Smartron isn’t a startup having too many products on the market to choose from. They release very few gadgets in the market. Their latest offering is the Smartron Sachin Tendulkar srt.Phone. It is an android mobile phone with a low-to-medium end price point. The first thing that hit my mind when I came to know about this device is how to pronounce its name correctly. I feel they should have given a better name to this device. They just took the initials of Sachin Ramesh Tendulkar (SRT) and named it. But it could have been called using his name in a better way. ‘Hey buddy, which phone are you using?’, the users of this phone have to face a hard time answering this question. Well, coming to the point why this phone is so unique and why is the hype around? The reason is their branding with Sachin Tendulkar for this device. It is reported that Tendulkar has invested in the manufacture of this device. On the user’s end, every unit of this mobile phone will be having the Autograph of this versatile player on the back cover of the cell phone. However, these back covers are to be purchased separately. 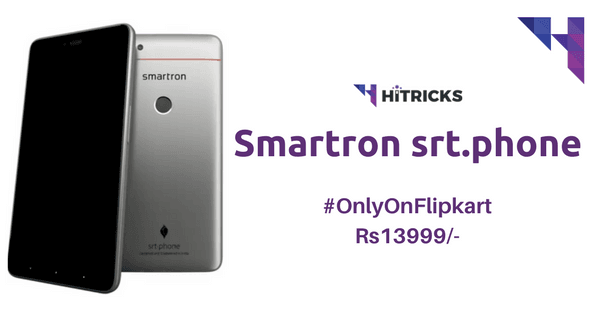 The phone is being sold exclusively at Flipkart with a hashtag #OnlyOnFlipkart. 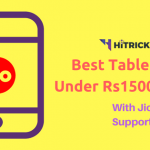 Let’s check out the price and the features what this phone has to offer. Opening the box, you will get the following: The Handset, the quick charge power adapter, a type C cable. No Headphones are available. The phone itself weighs 155grams. The Smartron srt have a 5.5 inch Full HD Display screen, with three feather buttons at the bottom of the display for performing the usual Home, Back and Recent App actions. On the top of the screen, we have the front camera and the phone call audio output. At the top part of the mobile phone, we see the power button and the 3.5mm headphone jack. While we do have the volume rockers on one side, the other side is completely blank with no physical buttons. On the back, we have the rear facing the camera, the flash, and the fingerprint sensor. There is a smartron logo somewhere in between. Let’s quickly check out the features of this phone. For the hardware, this phone is using the Qualcomm Snapdragon 652 Processor (Thank God they stuck with Snapdragon. Honestly, I am not a fan of Mediatek Processors), with a 4GB Dual Channel LPDDR3 RAM. The processor has eight cores: Quad ARM Cortex 1.8GHz A72 + Quad ARM Cortex 1.44GHz A53. Adreno 510 GPU powers it. It runs on Android v7 Nougat. Its rear camera is a 13MP Shooter with Phase Detection Auto Focus (PDAF) and BIS Sensor. So it is expected that this phone can shoot great low-light images. On the front, it has wide-angle 5MP Shooter. The internal memory of this device is 64GB, but it offers unlimited cloud storage with tcloud. So, you don’t need to worry about storing your data. OTG Cable is supported too. 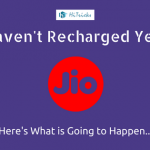 It is a dual sim device, which supports VoLTE so that you can use a Reliance Jio sim with it. It does not come with external sd card support. It supports a battery of 3000mah, which is sufficient to power this phone for the whole day. But, if we look at the competitors in the market, the Redmi Series of phones, including Redmi 3S, 3S Prime, Note 3 and Note 4 all has around 4000mah battery in lower price point with almost similar features. They last more than a day easily. The usual Bluetooth, NFC, etc. are available. Apart from Fingerprint Sensor, this phone also contains other sensors like Accelerometer, Gyroscope, Proximity sensor, Ambient light sensor, and Digital Compass. These are more or less the details of the Sachin Tendulkar Smartphone. However, you can check the detailed specification below. Here is the detailed phone specification of Smartron srt.Phone. That’s all about the Sachin Ramesh Tendulkar mobile phone by Smartron. Thanks for reading the post. I hope I was able to provide you all the details for this device. If you have any other queries, you can ask me below. Do share this post with your friends who are die hard Sachin Fans and let them know about this device. Let me know your opinions about the device in the comment section below. I will be back soon with another interesting article. Thank You.